Friday, Dec 22, 2017–SystemsGo presented an achievement award to last year’s senior students from Fredericksburg High School who participated in the Goddard-level rocket launch at White Sands Missile Range (WSMR) on June 28, 2017. The students spent their senior year in high school designing and building a rocket to carry a research payload to an altitude of 80-100,000 feet. After launching their rocket at WSMR, the FHS students earned the Newton-level Award, which recognizes achievement for a flight from the surface up to 25,000 feet. 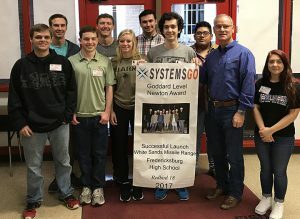 According to Scott F. Netherland, Executive Director of SystemsGo, who presented the award, the FHS student rocket earned this recognition for achieving all flight readiness review tasks, having a successful ignition and launch, and deploying its payload. However, soon after launch, the rocket lost oxidizer flow from their liquid oxidizer tank and the rocket motor burned out before reaching their intended altitude. SystemsGo sponsors the curriculum and the rocket launches. Most of the students who returned for the banner presentation are currently in their freshman year of college and were home for the holidays.